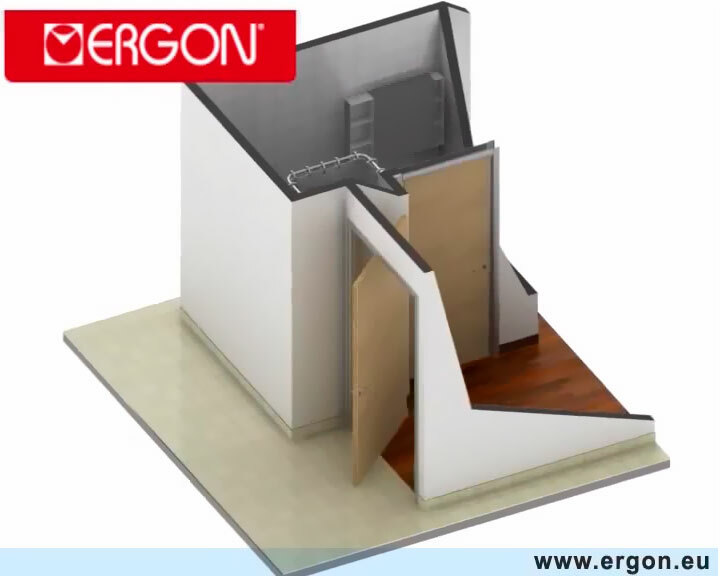 ERGON®, the door that swings and slides, is ideal for interior design in conformity to health and safety standards and regulations. ERGON® lends itself especially to interiors planned for people with mobility difficulties. The door opens from both sides, allowing access to and from the same room with a simple push of the door leaf, which closes again with ease. The leaf moves in a longitudinal arc as the door is pushed open from either side, leaving room for manoeuvre and allowing through traffic on a scale previously inconceivable. Two-way opening and space saving come in response to the problems associated with main exit routes and overcoming structural barriers. In fact a person constrained by a wheelchair or with mobility difficulties will be able to open or close the door leaf with a gentle push. ERGON® Community leaves space free and overcomes dimensional and design constraints. An ordinary subframe is all it takes to install this door with its immense variety of finishes and sizes. ERGON® Community opens and closes silently, is easy to clean, requires no particular maintenance effort and makes interiors more spacious. No extra cost: but so many advantages and genuine convenience. The simultaneous rotation and swing movement of the door leaf during the opening and/or closing stages saves 50% of the layout space. This makes even small rooms accessible. The leaf is simple and easy to move, and runs much more smoothly than a traditional door with a stop.